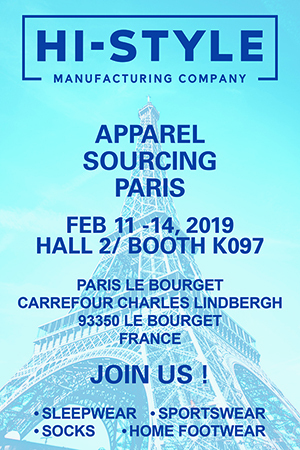 We are once again delighted to announce our participation at Apparel Sourcing Paris, February 2019. We had a great show in September 2018, and are returning next month to further market our range of sleepwear – robes, pyjamas, & jumpsuits; socks; home footwear; sportswear & other fashion accessories. We continue to innovate and freshen our product range with new fabrics, trims & accessories. These will be on display at the show, so be sure to visit. Representatives from our company will be at the booth to answer any questions you may have about our product & services. If you would like to set up an appointment at the show, please email us at info@hi-style.com. Please provide your full contact details, & the product categories you are interested in.